Industrial processes have an unfavourable influence upon the natural environment. These unfavourable effects can be divided into two groups: depletion of limited non-renewable resources and rejection of harmful substances. The depletion of non-renewable resources should be minimised to keep them for future humankind. Exergy can be applied as a measure of the quality of natural resources. The influence of human activities on the depletion of natural resources can be evaluated by means of cumulative exergy calculus. 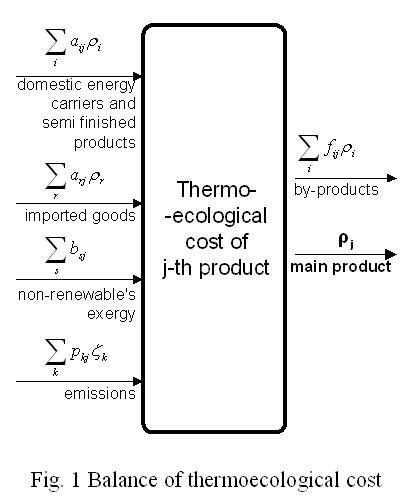 The thermo-ecological cost is defined as the cumulative consumption of non-renewable exergy connected with the fabrication of a particular product with inclusion of additional consumption resulting from the necessity of compensation of environmental losses caused by rejection of harmful substances to the environment (Fig 1.). Moreover, the index of thermo-ecological cost should take into account the total life-time of the considered product or system. It has to be stressed that the thermoecological cost is expressed in exergy (energy) units not in monetary ones. comparison of sustainability of different useful products. where: aij coefficient of the consumption and of the i-th product per unit of the j-th major product, fij -- coefficient of by-production of the i-th product per unit of the j-th major product, - arj coefficient of the consumption of the r-th imported semi-finished product per unit of the j-th major product, bsj exergy of the s-th non-renewable natural resource immediately consumed in the process under consideration per unit of the j-th product, pjk - amount of the k-th aggressive component rejected to natural environment per unit of the j-th product, cumulative exergy consumption of non-renewable resources due to the emission of unit of the k-th waste product, specific thermoecological cost of the i-th and j-th main product, specific thermoecological cost of imported r-th good. Thermoecological cost resulting from rejection of harmful substances to natural environment can be evaluated by means of monetary indices of harmful impacts. where: annual exergy consumption of non-renewable natural resources, monetary coefficient of ecological damages per unit of the k-th aggressive waste product, - annual production of the k-th aggressive component of waste products rejected to the environment in the considered region. The set of balance equations (2) should comprise all the branches of domestic economy. However, it would be difficult to solve such a problem. For this reason in practical calculation only strongly connected production processes are taken into account. where: - nominal flow rate and specific thermoecological cost of the j-th raw material, semi-finished product or energy carrier supplied to the production process, - nominal flow rate and index of the specific thermoecological cost of the k-th deleterious waste product rejected to the environment, nominal production rate of the useful u-th by-product, specific thermoecological cost of the i-th major product replaced by teh u-th by-product and replacement ratio in units of the i-th replaced product per unit of u-th by-product, - annual operation time with nominal capacity, nominal life time of installation (years), expected recovery factor of m-th material after, - consumption and specific thermoecological cost of the m-th material or energy carrier used for the construction of the installation, expeced consumption and specific thermoecological cost of the r-th material or energy carrier used in repairs. Stanek (Ed) (2017). 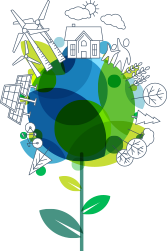 Thermodynamics for Sustainable Management of Natural Resources.